Silent Night Chapel in Oberndorf bei Salzburg, Austria. Silent Night(Stille Nacht in German, Silens Nox in Latin) is perhaps the most beloved Christmas Carol. It was composed in 1818 by Franz Guber, an organist and schoolmaster, to lyrics by Father Joseph Mohr of the St. Nicholas parish in Oberndorf bei Salzburg, Austria. It was first performed on Christmas Eve in 1818 and since the organ was broken, the only musical accompaniment was the guitar. The popularity of the song spread and the version commonly used today comes from a translation in 1859. John Freeman Young, serving as an Episcopal priest at Trinity Church in New York City, translated and changed the tempo of the song. The original rendition by Gruber was more like a dance tune and sung faster. Young made into a slower lullaby style that is the most common version today. 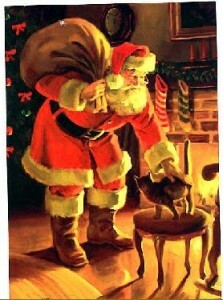 Because it has been so widely translated, it is the one Christmas carol that is known worldwide. 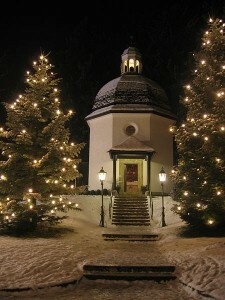 In Austria Silent Night is not heard until Christmas Eve, usually around 9 p.m. Then it is played on the radio once an hour and of course during church services. In the movie The Nativity Story Mychael Danna composed a version that is both beautiful and wonderful. He used Latin but in a different way to match the well known melody (the normal Latin text would make this hard). Here is the version used in the movie. There are variations on YouTube where others have created wonderful montages using his version. Translation by Josh(SilentRebel83) at http://lyricstranslate.com/en/silens-nox-silent-night.html. Here is an another version, albeit more modern but just as beautiful. John Denver and The Muppets perform this for a live show with children in attendance. Enjoy.